The name or this place means’ the sound of the rapids’. Dan Ta Bai is located on the Upper Suriname River All which sets out into the Brokopondo reservoir. 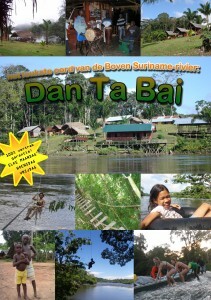 The trip to Dan Ta Bai goes through the jungle of Suriname. The road is about 176 km long and takes 3.5 hours. Once at the destination, we sail to a beautiful rapids called: Apresina Sula. It is about 5 minutes by boat, where you can swim. We also visit from Dan Ta Bai a traditional marron village. Here you can witness how the locals hunt, fish, build canoes , make clothes and sell them and prepare food. During the walks you can encounter different species include; forrest monkeys, parrots and screaming Piha’s. Dan Ta Bai organizes cultural evenings especially for tourists. Here’s Danced to traditional music. At Dan Ta Bai you will definitely not be bored, for a small charge you can use the Adventure Island. Here you can swish of the cable cars, engage in archery or swing with the Tarzan Swing Into the water. Dan Ta Bai something for everybody, peace, culture and adventure. Want to mix culture with adventure, don’t hezitate book your trip to Dan Ta Bai!